Just Jingle: I Miss Your Face! It's true. I do miss your face. It has been very slow around here and I miss creating and blogging! My studio is coming together, though, and I hope do get some things made this weekend. My hands need PAPER and STAMPS! Today, however, I have a brand new Simon Says Stamp Wednesday Challenge for you! It's a TIE IT UP! Challenge! We want to see you using string, twine, or ribbon on your creations this week! The Design Team is featuring Paper Smooches today. You don't have to use them in your projects, but if you have some on hand, we'd love to see how you rock them! Paper Smooches has SUCH cute stuff! They have been a favorite of mine for a long time! 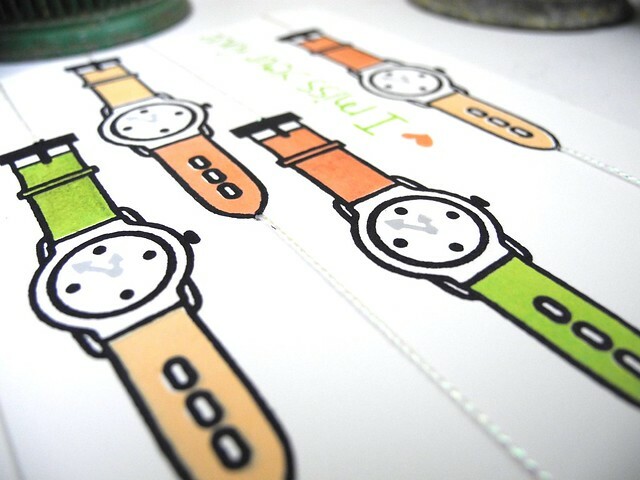 I used the absolutely ADORABLE Tick Tock clear stamp set for this card. I sort of kind of love and adore it. And this sentiment... LOVE IT! For reals, though. For. Reals. I added a bit of interest by stringing some May Arts Iridescent white string along with my watches. I love this look! Now it's YOUR turn! Create something fabulous inspired by the Tie it Up! theme and link it up over on the Simon Says Stamp Wednesday Challenge blog for your chance to win a $50 Gift Voucher to the Simon Says Stamp store! Woot! Woot!!! You can find my complete supply list below. This post contains affiliate links. As always, your support is appreciated! P.S. Don't forget to check out the Simon Says Stamp KIDS Challenge, too! Get those kids CRAFTING! I am also linking this card up to the Paper Smooches Sparks Anything Goes Challenge! YAY!!! Oh how cute Jennifer!! Great card! Love that stamp set! What a fantastic take on the theme this week, Jennifer! Love your idea! This is adorable! I love how you used the string! So fun! I love how you colored the watches too! A super card Jennifer - a fabulous 'set' of watches and I love the fun sentiment!! I have been so tempted to get that set - such a creative and fun card. Oh my this is so very creative :) love those colors on the watches ! Such a clever way to bring this set to life!! Love it and love the coloring! hey girl! this is super fun, it reminds me of a retail window display at Macy's...awesome...luv this! hope you have a fabby weekend! This is so lovely! I LOVE the use of strings and the colors are simply gorgeous! Super cute! I love the card and your photo backdrop is super cute too! Great use of the strings. I really love the hanging watches Super cute card. Love it! 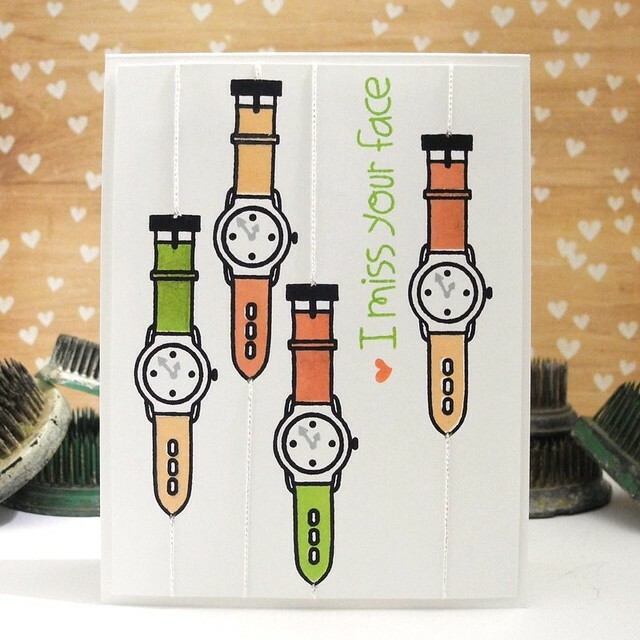 Fabulous card, love how you've used the twine and the watches are brilliant. Fabulous colours and design, Jennifer, have a wonderful weekend sweetie! Love those watches paired with that fun sentiment! Oh my goodness...this is so fun! Love, love, love Jennifer. Thanks so much for playing with us at PaperSmooches Sparks! I love the way you used the thread to keep all those watches lined up! Super cute card with a great sentiment too! I saw your card featured on the Paper Smooches FB page as one of our "FB Featured Players" from the August Anything Goes (wk1) challenge--- congrats!